The trick to visiting the Deschutes Brewery is pacing. When you walk into the main brewery, near Bend’s Old Mill District on the banks of the Deschutes River, you are greeted by a bar with all of their beers on tap, ready to be tasted. Some, and I am not naming names, might not even make it to the tour, but rather belly up to the bar and stall sampling as many of the fine ales, porters and damn tasty beers (their description which I wholeheartedly agree with). Established in 1988, the Deschutes Brewery is a must-see if you visit Bend. This is their home turf, and there is nothing quite like watching thousands of bottles of beer go through the process of being brewed, bottled and shipped. The brewery is the fifth largest craft brewer in the United States, and number one in Oregon, which is a Mecca for the craft and microbrewery industry. The bottom line is they bottle quite a bit of beer, and you can watch the amazing process, step by step. In fact, in 2010 they went through 50 million bottles, which are made with 20-percent recycled material. 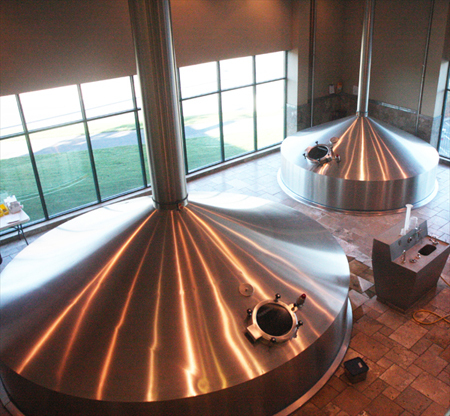 The brewery can fill 380 12-ounce bottles of beer a minute for 220,000 bottles per day. They are adding a night shift to increase that production by 50 percent. It is far and away the largest brewery in Bend, so if you are taking the grand tour, starting here would be good so when you visit smaller breweries, you get a sense of scale. Tours are offered for free and on a first-come, first-serve basis. They start at a modest company store with the aforementioned bar where you get four complementary tastes. Deschutes Brewery in Bend OregonFrom showing you the different types of hops and what they should look like, to the barley and other ingredients put into specific brews, the tour is very educational if you have an interest in brewing. Those who are interested in business can hear about the company’s history, and if you are interested in drinking the beer, the free samples are a very nice cap to the tour. Wilson shares many interesting and funny stories about not only how the process of bottling that much beer works, but also about employees exploits and the adventures in the quality control booth. Walking by the huge silver tanks reminds you more of a missile silo than a brewery, but the sights and smells remind you exactly where you are. Many of the tanks in the brewery are even made in Oregon. But tour guides don’t just stop at explaining about the beer-making process. They are also a wealth of information on local attractions, including other breweries and places to eat – especially the Deschutes Pub in Downtown Bend. Wilson said the pub is used as the research and development arm of the company, with the smaller brewery creating new beers and then test marketing them to the public to find out what works, and what needs to go back to the drawing board. So whether you like the “Hop Trip,” or “The Abyss” or want to stick with the class Deschutes brews of “Mirror Pond Pale Ale” or “Black Butte Porter,” visiting the brewery is as interesting as it is fun. About Deschutes Brewery: Located in beautiful Bend, Oregon, Deschutes Brewery overlooks the wild and scenic Deschutes River. It’s home base to our adventurous, award-winning lineup of pioneering beers. What to bring: Photography is tricky during the tour, the plant has the light of an industrial plant, so make sure that you are familiar with low-light photography. In addition, make sure you eat something before you visit, especially if you are going to be driving after tasting some of the samples. Tip: While they don’t take reservations, make sure that if you have a big group you call ahead to let them know you are coming. Tours are given out about four times a day, and the size limit is 15 people. Wilson said that during the summer months that tours fill up quickly, so make sure to stop by early to make sure you get a spot. Season: The brewery is open year-round. Getting there: Deschutes Brewery is located at 901 Southwest Simpson Avenue, Bend. It is right off Cascade Lakes Highway, also known as Southwest Colorado Avenue which runs right through Bend.